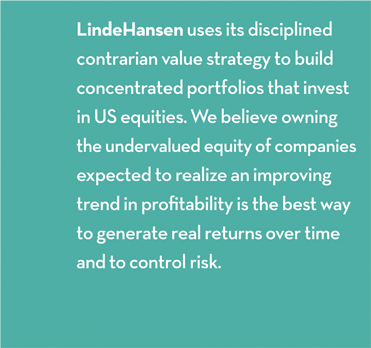 Home | Linde, Hansen & Co.
Investors should carefully consider the investment objectives, risks, charges and expenses of the Linde Hansen Contrarian Value Fund. This and other important information about the Fund is contained in the prospectus, which can be obtained by calling (855) 754-7933. The prospectus should be read carefully before investing. The Linde Hansen Contrarian Value Fund is distributed by Northern Lights Distributors, LLC, member FINRA/SIPC. Our disciplined contrarian value strategy may not meet its investment objective and you could lose money by investing in the Fund. Our concentration in U.S. equities has the risk that changes in the value of a single security may have a significant effect on the Fund’s value. Value investing involves the risk that such securities may not reach their expected market value, causing the Fund to underperform other equity funds that use different investing styles. Linde, Hansen & Co., LLC is not affiliated with Northern Lights Distributors, LLC. Investments are not FDIC-insured, nor are they deposits or guaranteed by a bank or other entity. This website is intended only for investors and prospective investors residing in the United States. This website should not be considered a solicitation or an offering of any of the Linde Hansen Funds to individuals residing outside the United States.